This traditional home is in a 55 and over development. The home remodel was designed to create a light and airy living space on first floor with traditional upholstery design of French red toile on the wing back chair and a desired theme of red white and blue colors used throughout the living spaces was the client’s request. We provided interior design services for each room in the home including the kitchen, dining room, living room, bedrooms, bath, foyer and sunroom. The exquisite kitchen has a timeless design and is easily maintained. The dining room was overcrowded so much of the existing furniture was reused in different rooms. The design of this home called for disbursement of existing furniture and area rugs. This had the effect opening the space, removing trip points and highlighting accessories. In the foyer, furniture was used to create an inviting entrance. Pictures were utilized throughout the two story wall reducing the monumental feel. The living room wall color was changed to soft white with a hint of blue. The red accents compliment the dining room wall color. The kitchen wall color is Sherwin Williams Silverpointe, allowing for the warm cherry kitchen cabinets to be noticed. The countertop is granite. The kitchen cabinets were designed to create space for the removal of clutter. 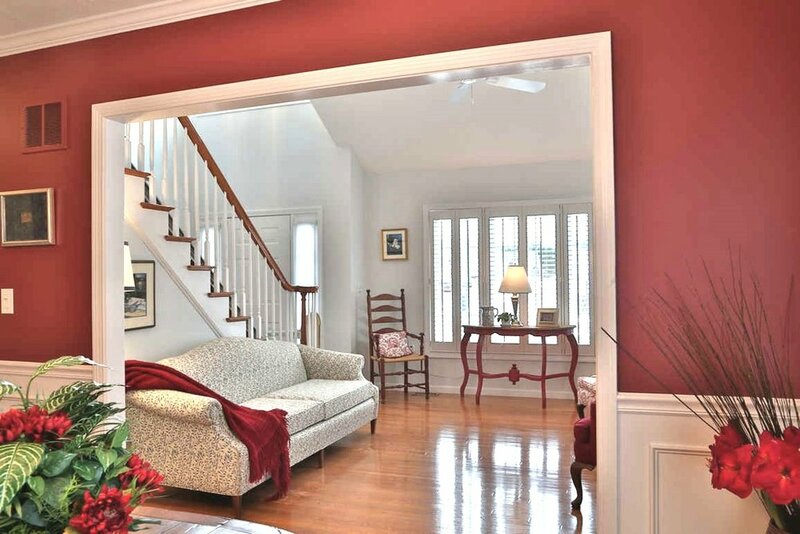 The dining room has white wainscotting and deep red walls making a luxurious, bold statement.